Tekonsha P3 Electric Brake Control Controller RV Camper - $115.88.. The Tekonsha P3 is a breakthrough among proportional trailer brake controls, offering a system that’s smooth and proportional with a multi-functioning LCD display featuring the most advanced easy-to-use diagnostics. Consumer preference drove the innovations that are incorporated into P3 including the capability of switching between an electric brake system or a hydraulic brake system. 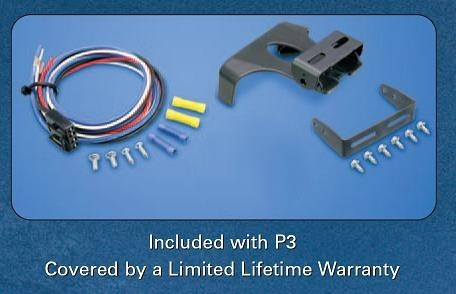 P3's convenient features include a dash-hugging design, unique easy-to-use clip-mounting system, quick disconnect for a safe storage when not in use and the original "boost" feature that allows the driver to increase the initial power delivered to the trailer brakes. Including a range of diagnostic features, a pre-assembled wiring harness and a limited lifetime warranty, the P3 is for 2, 4, 6 and 8 brake trailers. 1 per box.